Guys, I'm totally having a blastie playing around with grain free and gluten free cooking and baking! No, we Mains don't need to eat this way, but gosh- when it's easy and fun (and yummy), why not incorporate it every so often!? Plus it sort of reminds me of science experiments I used to do in elementary and Jr High school. There's all these "weird" components; you mix them together and create something awesome! Like these graham crackers for example. I know what traditionally goes into a graham cracker but when one can't eat those particular ingredients because it could possibly harm their bodies, substitutions need to be made. Flour becomes coconut flour (or in some cases almond flour), sugar or brown sugar becomes honey (mmmm or maple syrup) and so on. I was so intrigued when I read this recipe that I quickly added it to the other 100 tabs in the Against All Grain cookbook. Plus this recipe is super easy and pretty straight forward. I've come across some crazy grain free and gluten free recipes that need 1 million different flours, "gums", "sweeteners" and such. When I see those I run straight for the hills. I don't have the time (or the money) for that. Also, I'm sure you're surprised- but I added dark chocolate drizzles because I'm still desperately needing and craving all the chocolate things. Sigh. 1. Preheat oven to 350°F and center rack in the middle of oven. 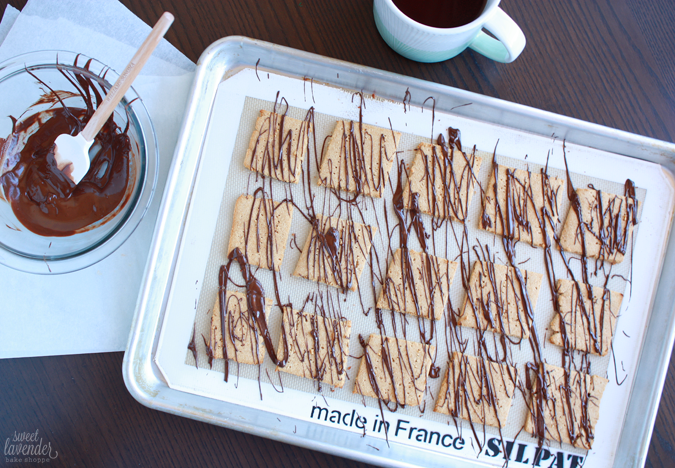 Line a sheet pan with a silpat and set aside. 2. Into a stand mixer bowl, fitted with the paddle attachment, add the egg whites, coconut oil, honey and vanilla extract. Here's a great way to make sure the honey doesn't stick to your measuring cup. Turn mixer to medium and beat until mixed together, 2 minutes or so. Small bits of coconut oil are perfectly fine. 3. While the wet ingredients are mixing, sift together the coconut flour, ground cinnamon, sea salt and baking soda. 4. Turn mixer down to low and add in the dry ingredients. Mix until everything is combined and it comes together into a ball of dough. Dough might seem sticky and wet at first, but within a few seconds that coconut flour will absorb everything and it'll dry out a bit and form a ball. 5. Roll ball of dough between two pieces of parchment paper until it is about 1/4" thick. Carefully transfer parchment/dough onto your baking sheet, pull away top piece of parchment and cut dough into 2"x2" squares carefully, using a pizza cutter. 6. Gently place top sheet of parchment back onto the dough and place into the refrigerator to chill about 25 minutes. 7. Once chilled, carefully remove dough from sheet pan, pull away top piece of parchment and transfer squares onto silpat, spaced a 1/2" apart. They won't spread much. Make sure to be very careful when transferring squares to sheet pan- they will want to break apart. But by using an offset spatula or some other type of very thin spatula, and going under entire square before lifting, you should be fine. 9. Bake in center of your oven for about 16 minutes, turning pan half way through baking time. They're done when they have slightly browned around the edges. Remove from oven and allow to cool completely on pan before trying to move. 1. Create a double boiler with a small pot of gently simmering water and a non reactive stainless steel or glass bowl on top. Do not let simmering water touch bottom of bowl. 2. Place the dark chocolate chips or pieces into the bowl and stir around gently until chocolate is completely melted. 3. Remove bowl from the heat and stir in the coconut oil. 4. 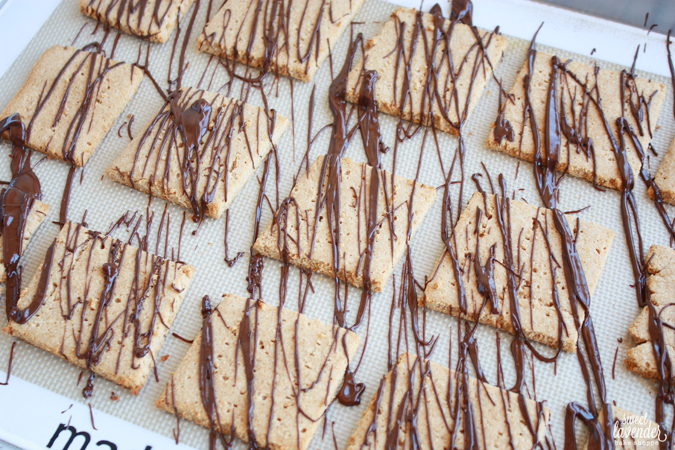 Drizzle ALL over cooled baked graham crackers and enjoy! **Crackers will be chewy in texture because of the honey :) Crackers also store best in an air tight container in the refrigerator once completely cooled.